Having gotten a grip on what a fountain pen is, why should one bother using one? Because by most measures… they’re better than anything else. This is a bold statement, and not universally true; there are some surfaces that a fountain pen will not write on, and some circumstances they have trouble facing, but in general use they are hard to beat. Keep in mind that, as I lay out elsewhere in this site, fountain pens are a mature technology– most of what problems they have that can be done away with have been done away with. 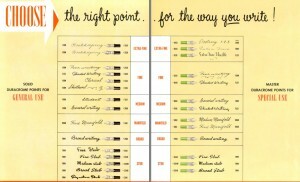 The following points are each an imperfect argument for fountain pens, when taken as individuals, but combined make for a position which is very hard to answer as to the best writing instrument possible. Fountain pens require less work from the user. Consider the mechanism of ball-point and rollerball pens (which I will for my own sanity call “ball-tip pens” for the rest of this page)– a small bearing rotates against the paper on one side, and on the other rotates through the ink. To manage this, one needs to press the pen firmly enough against the paper for friction to work the ball. Pencils, working by abrasion, are likewise reliant on pressure. Fountain pens, on the other hand, are a tube of ink with a tiny opening at one end, and are anxious to put ink on the paper at the slightest touch. In this, they are equalled only by fibre-tip pens and brushes, neither of which is quite as convenient for prolonged writing. The difference this produces in one’s writing is hard to overstate, since the extra downward pushing tends to distract from the actual act of making letters. I’ve read in a pen-fanciers’ forum that some people with chronic maladies affecting their hands or arms had given up on writing until finding fountain pens. Fountain pens write more smoothly than other pens. 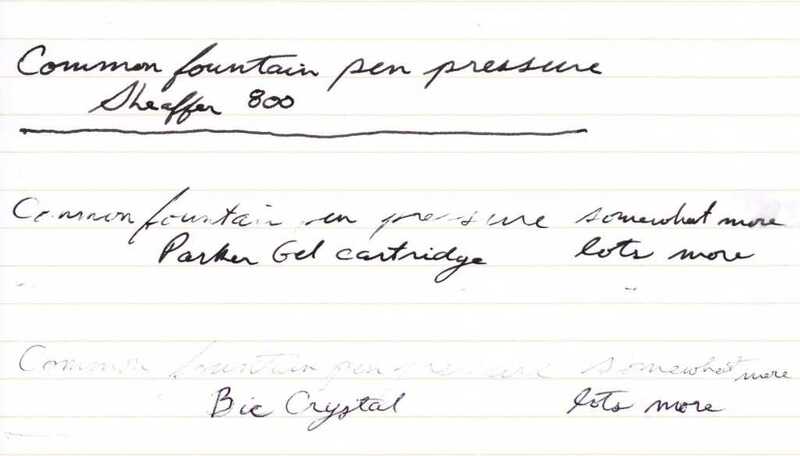 The contact point of a fountain pen is a polished bit of metal riding on a bed of lubricating fluid. I don’t imagine anyone who has used a Sharpie on a cardboard box needs that squeaky friction described to them. Ball-tip pens, with their little ball-bearing at the working end, have the potential for smooth writing, but the pressure required to actually make them do anything tends to emphasize the irregularities in the paper. I should for honesty’s sake mention that if the tines of the point are out of alignment, which can happen from either an accidental blow or heavy-handed use, this advantage disappears and is replaced by a sensation not unlike trying to write with a couple of pins lashed together. Fountain pen writing is of consistent visual weight. This is another point where fibre-tip pens come up to the same level as fountain pens, and where ball-tip pens have a lot of trouble. 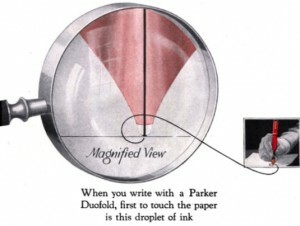 The latter, in their way of renewing the ink supply by rolling their ball around in it on the far side from the writing, can show blank spots when the ball changes direction or if the pressure applied drops below the necessary threshold. They can also develop some ugly blots when a blob of ink builds up where the ball meets its mounting and then catches on the paper. As you can see, using the sort of pressure that is optimal for a fountain pen, the other two can only just produce a legible line. It’s pretty clear that my writing degrades when I’m called upon to press firmly on the pen to make a mark, too. Fountain pens allow for more individual expression. Apart from the greater freedom of movement conveyed by the light pressure requirements, fountain pens give the user more ways to show their own character in writing than any other writing instrument. There are more sizes of point available than in other pens, and between this and the possibility of different shapes of point, whether from the factory or by an after-market nib-shaper, means one can have writing of a shape to please one’s soul. There is also a lot more choice in colour, since one is not bound to use whatever the manufacturer has put into the pen– there are loads of different makers of ink for fountain pens, and with some searching it is possible to find the perfect compliment to the user’s mood. Fountain pens are extremely durable. While one has to think a little bit more about the care a fountain pen requires, in terms of both use and maintenance, it will outlast a vast number of any other sort of pen. A fountain pen will run through a load of ink in twenty or thirty pages of writing, while a roller ball might last for dozens of pages and a ball-point for hundreds… but I can easily put more ink in a fountain pen and do not see any way to get more ink into a ball-tip. “Ah-hah!” cries the critical reader at this point. “It’s easy to put more ink into a ball-point!” I say it’s not, and I can prove it. It is, I grant, quite easy to replace the contents of a ball-point’s barrel. However, in replacing the ink supply of the ball-point, one also replaces the writing tip itself, and that represents the soul of the pen, or at least its character. By analogy, refilling the ink in a fountain pen is like putting more gas into a car, while replacing the ink in a ball-tip is like finding one has to replace the whole engine when the fuel gauge reads empty… and you can’t be sure until it’s bought and installed whether it’s an engine made by Rolls-Royce or Trabant. When I say “I put new ink in one of my favourite pens,” I know that it will continue to be one of my favourites, since I didn’t throw its writing qualities away to make room for the refill. Of course, not all non-fountain pens are meant to have their ink supply recharged. Many are meant to be thrown away when empty. We are, in the “developed” world, starting to understand that this really isn’t a wise way to conduct our collective business, being wasteful in resources. A fountain pen does not use much more in terms of raw materials than a single Bic, but might last for decades. I’ve certainly got pens that are about to enter their second century of service, in one case with no replacement parts needed whatsoever, and in the rest the mere replacement of a flimsy rubber sac every decade or two. That is an efficient use of resources. Which brings us to the point of actually going out and getting one.